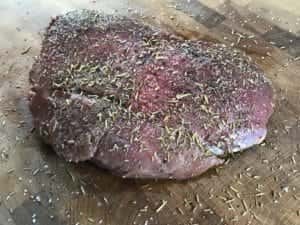 This is a recipe for grilled deer topside roast. It is not the first time I am grilling deer. In fact, I cook venison quite often. 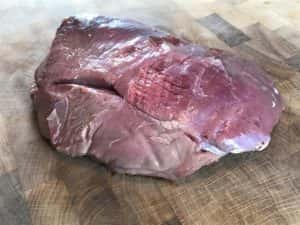 I have also written earlier about cooking deer. This time, however, was the first try in Monolith Kamado grill. My cut was topside roast from the young deer. It was only 1,3lb (600g), but big enough for three people I was about to feed. 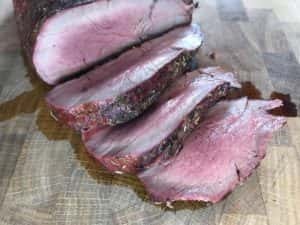 Topside roast is one of the most tender cuts from the upper back of deer. It needs to be cooked medium rare. If you go much beyond 135°F (57°C), it gets chewy. So, keep your eye on thermometer. I prepared the roast by removing all membrane. Then seasoned it with kosher salt, black pepper, thyme and rosemary. I left the roast in fridge for an hour and started my grill. Again, I was going for reverse sear method. First indirect heat and then fast searing both sides at the end. This topside roast was so small that it was pretty much done in half an hour. 20 minutes indirect 300°F (150°C) heat, 5 + 5 min direct searing both sides. Before carving and serving, I foiled the roast for 15 minutes and let it rest. This treat calls for red-wine sauce and root vegetables on the side.